Help us finish the fight against cancer by joining us for the Nebo HOPE Run 5K. $20 registration for the 5k includes a races t-shirt and much more. Special Cancer Survivor registration, with additional prizes for winners in several categories, including a special division just for survivors. We'll have families of all shapes and sized joining us, businesses, school teams, neighbors and friends. All profits from the race will go to the American Cancer Society's Nebo Relay For Life. Registration 7:00 pm with the 5k starting at 8:00 pm at the Spanish Fork Sports Park, 296 W. Volunteer Dr, by the veteran's pavilion and travels along the beautiful Spanish Fork River Trail. Bring your neon, glow sticks, light up shoes, LED hats, light up belts and backpacks; your light up wands and fairly light tutus to help us light the way to a cure! 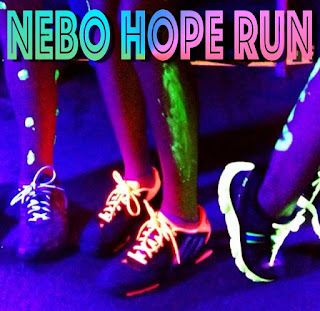 The Nebo HOPE Run will be a wonderful opportunity for families to celebrate life as we race to save lives! Join us in picking up the pace from a walk to a run to the finish line as we finish the fight against cancer. HOPE doesn't float... it Runs!!! Nebo HOPE Run 5K copyright protected by Nebo Comfort Systems Community of Caring. Picture Window theme. Theme images by ULTRA_GENERIC. Powered by Blogger.